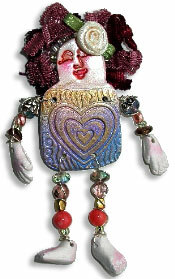 Dottie has created a line of polymer clay "crazy Lady" bodies that she stamps, forms, cuts, and decorates. Each one is unique & oh-so-fun to assemble with bits of wire, ribbon, beads, and your imagination. Cute hands, feet & a pin back are included in the kit available at StoneBrashCreative.com. Beads and notions of choice, make things match or mix them up!